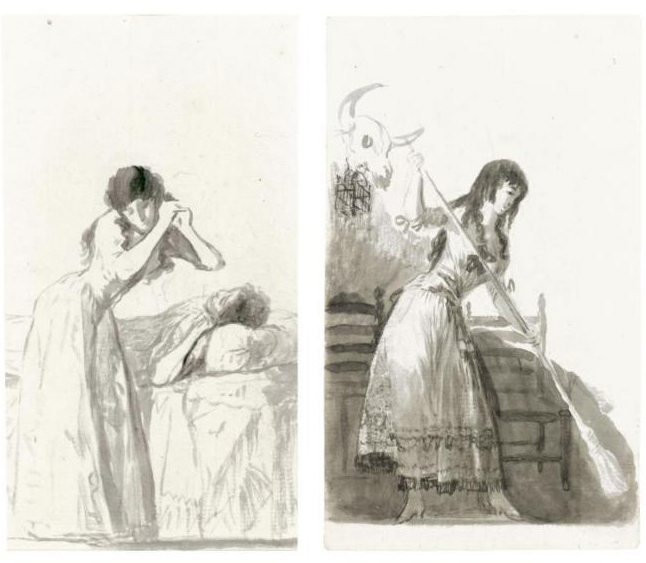 These images appear in Gassier's "The Life and Complete Work of Francisco Goya" on pages 171-172. They are numbered images #368 and #369 respectively. They are on the reverse sides of a single sheet of paper. The drawings are rendered in indian ink wash (ink diluted with water to enable grey tones). This double-sided page was part of the so-called Sanlúcar album and is among the best images from it. ...Gassier stresses the importance of the Sanlúcar album, saying that to his knowledge this is the first time that Goya uses wash on its own, and he again quotes Carderera, who eloquently describes the effect of this medium:'It is impossible to convey the clearness of the lines in most of these drawings, done with the very tip of the brush dipped in Indian ink...'. 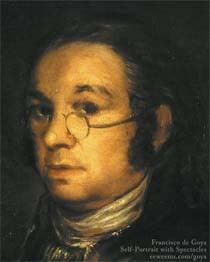 Goya's drawings up to this moment had been preparatory studies for paintings, executed in a classical technique of red and black chalks, so the Sanlúcar album represents a dramatic shift to a medium which became essential to him, particularly in the later albums..